We noticed and believed that there is evangelism potentiality in North Jakarta, especially in the area of Pluit, Teluk Gong, North and South Bandengan, and their neighborhoods. Because of the vision, in May 1983 seven brothers and sisters leaded by Rev. Ali O. Angkasa started up a prayer meeting at brother Natan’s residential (Jalan A I No.65A T.Gong Jakarta Utara). Through God’s lead, on 4 June 1983 we could rent a shop house (ruko) in SOKA area, located on Jalan Terusan Bandengan Utara No. 95 C Jakarta Utara for 2 (two) years with the price of Rp. 6.500.000,-. 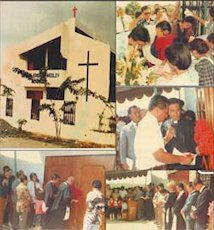 By consensus the church was then called “Persekutuan Kristen Methodist Indonesia” (Methodist Christian Fellowship of Indonesia). The first Sunday service and Sunday School were held on 10 July 1983. The first sermon, themed after “Berjalan dan Melompatlah Memuji Tuhan” (Walk and Jump to Praise the Lord) was delivered Rev. A.O. Angkasa and translated by Rev. Chen Sui Kie. The first Sunday Service and Sunday School were attended by 125 adult and 23 children respectively. 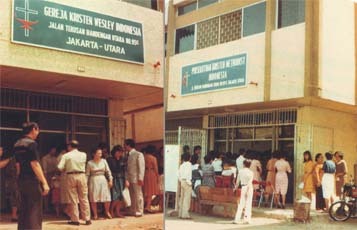 To achieve a legal standing, on 25 August 1983 the church status was therefore legalized and registered to Indonesian Bimas Kristen DKI Department of Religion Affairs and to Department of Justice. The registration was represented by brother Silas, brother Hasan, sister P.J. Judith, sister Lina K and Rev. A. O. Angkasa, whereas Rev. S. A. Manalu STh acted as counselor. Months later, on 5 November, with the supervision of Pembimas Kristen DKI Department of Religion Affairs’ – Rev. 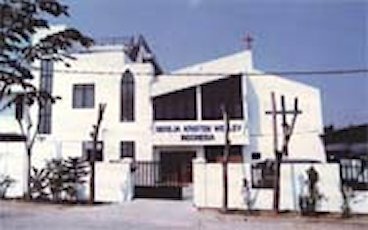 P. Siahaan S.Th – the church’s name was changed to GEREJA KRISTEN WESLEY INDONESIA (The Wesley Christian Church of Indonesia). Considering the increasing number of attendants, thus the worship hall sized 5m x 9m (45 square meters) was no longer sufficient, we planned then to build our own church building. On 17 April 1984 Church Development Committee was constituted. Praise the Lord, the plan gained great and touching support from our members. One of the members, once hearing the plan announced, gave away his (? Laki-laki) ring inherited from his late mother soon after the Sunday service. On the next day, though it was raining heavily, another member walked into the church and gave away his three year saving. Through struggle and prayer, we were blessed to buy two houses in Pluit Mas IV Blok C No. 14 A-B (current address) with credit plan the following month. Again, through the prayer and financial support of the members, the payment could be fulfilled in time. 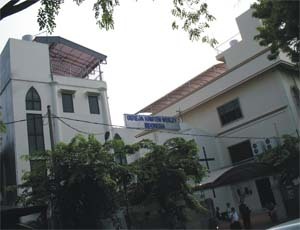 The new church building was dedicated on 3 June 1984, wherein Rev. S. A. Manalu STh had the honor to cut the opening ribbon, Rev. Tjong Oen Tek opened the church main door, and Rev. P. Siahaan STh (as Pembimas Kristen DKI) signed up the epigraph. Rev. Yosua Ong delivered the sermon while Rev. DR. Peter Wongso delivered encouragement words. On behalf of all the members of GKWI, Mr. Markus Honggo expressed greetings and gratitude to individuals who had given support. As the church grew, renovation was conducted to increase the capacity of the worship hall and to provide additional facilities. This project was started on 7 August 1990 and was entrusted to brother Arifin Wijaya. The project was completed in 135 days. In respect to the continuing growth and the need to provide better facilities, a committee was set up to conduct renovation in the worship hall interior. This committee was led by brother Sonny Muljono and partners. The work was started in October 2003 and was conducted within three phases: the first phase was to renovate the worship hall, the second phase was to build bible study (training) building, and the last phase was to renovate the offices, library, and pastor’s residence. Despite of national multi crisis (economic and other sectors), through faith, prayers, and church member’s support, God did provide all our needs. Finally, the whole program could be completed in 2006. To form a healthy and growing church required healthy believers. In face of this belief, our dear God had given Rev. A.O. Angkasa a very important vision, i.e. the need of spiritual training. Thereby he inaugurated an action called “7 in 1 movement” in 2003. This action believed that to become spiritually healthy and strong every member of the congregation should join one Sunday service (worship), one fellowship, one bible class, and one ministry, also exercise one good deed/day, spare one hour of private intercessory prayer/week, , and lead one soul to God/year. After one year, in 2004 “7 in 1 Movement” was then upgraded to “7 in 1 Action”. This action now becomes the ultimate way of life of every member of Wesley Christian Church of Indonesia.